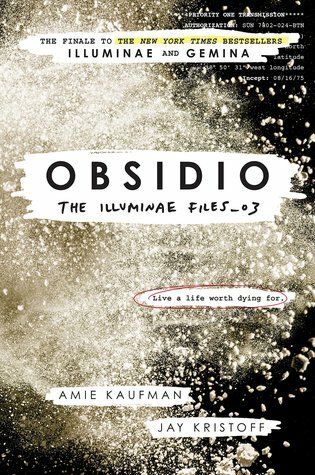 This is the third and final book in young adult science fiction series, The Illuminae Files by Amie Kaufman and Jay Kristoff which include Illuminae, Gemina, and Obsidio. You can read my review of Illuminae here and my mini review and live reactions of Gemina here. I thought this was a great conclusion to the series. Happy ever afters are my thing and I like how everything wrapped up nicely. Some people may criticize it for this but it was exactly what I was looking for. I was glad that I didn’t have to wait so long for for the rest of the gang to show up in the story instead of it being so focused on the two new main characters Asha and Rhys like the previous books. But I loved learning about Asha and Rhys’s back story and getting to know they and rooting for their romance. Although I really liked all six main characters/couples, I think my favorite guy was Nik and then my favorite girl is probably a tie between Hanna and Kady who are just so badass and sassy. I loved that they finally address they creating the Illuminate Files and acknowledge the characters describing out the kiss scenes and how hot everyone looks – I ALWAYS thought that was weird for a dossier but our funny teen main characters thought it was necessary to the story. It made me giggle and I dig their explanations. I was a little disappointed there wasn’t another gross adversary like the zombie plague and lamina drug monsters from the first two books but that might have been a bit much to invent another insane thing like that and stuff it into that final plot. This book did have some predictable moments like the attempted coup and I so totally knew Nik’s parachute was going to come in handy and then I definitely knew that’s what saved him and Ezra (though I still don’t fully understand how that would actually ever work) so I wasn’t all devastated like Kady was when their ship was blasted but I was worried that she or Hanna would do something super rash and kill themselves because of it. Then there were a handful of moments that really surprised me like omg when Katya got shot that was so terrifying!! I really did not think she was going to come back from that, but I was a bit surprised that that was the final straw to get the cease fire with those BeiTech goobers… especially since they didn’t seem to care about casualties or child casualties before. I would have maybe liked more info on who Ezra’s mom was and why she ended up where she did. I support Ezra not needing any additional contact or closure from her but I still felt like I needed some closure or something more – basically if she wasn’t his mom the story wouldn’t really have changed or been impacted at all. Let’s talk about AIDAN. Man, what a “villain”! I knew he was not done making decisions for everyone that get people killed! Also I definitely started to get weirded out that he was like… falling in robot love with Kady. But I did like that AIDAN wasn’t really gone in the end, it left a nice creepy after taste in my mouth. It’s hard to individually rate this because I can’t really do it without taking the whole series into context. I thought the whole series was an amazing adventure with such an enjoyable and unique format and a happy ending that it’s really 5 Stars across the board for me even if some of the novelty had worn off by this final book and it was a bit predictable in places. I thought it was such a good ending too! AIDAN is one of my favourite characters!